Nearly three decades ago, on a perfect summer night, hundreds of high-spirited guests, in classic chauffeur-driven antique automobiles, headed down the long drive at Round Hill…on their way to an enormous white tent, on a bluff, overlooking the water. It was the launching of what was to become one of the South Coast’s most cherished traditions, one which has continued to grow, in popularity, in significance and in merriment, year in and year out. On Friday, July 12th, right by the side of the sea at Demarest Lloyd State Park in South Dartmouth, the tradition will live on…top-shelf open bar… complete New England lobster-clambake dinner… an extraordinary silent auction…followed by dancing into the night to the strains of music by one of Boston’s top dance bands. Alison Durant has worked in marketing for nearly 20 years and is currently with San Francisco-based Oracle in Global Marketing. Residing in Dartmouth with her husband, Peter, and their two children, she has been an avid volunteer for a number of highly successful nonprofit fundraisers. Kelly Rebello is a full-time real estate agent, well known throughout the South Coast region and the owner of Hearth Heating, a family business, in partnership with her father. Originally from Fairhaven, she now resides in Dartmouth with her husband, Skott, and their two daughters, and also sports an outstanding record in organizing fundraisers for local causes. Because Ms. Durant and Ms. Rebello complement each other well, with core strengths in marketing, corporate sponsorship, team-building, and project management, it is expected that the event’s 2013 Steering Committee will be well served by the new leadership team. Both are enthusiastic about this opportunity to move an event, already a classic in its own right, forward with a dedicated group of experienced volunteers, assisted by members of the Lloyd Center’s staff and board of directors. According to the Center’s Executive Director, D’Arcy MacMahon, “The extraordinary popularity of this event is a tribute, not only to all the volunteers who give so generously of their time, but to the Center’s leadership in the ongoing battle to protect the fragile nature of our coast and give back to kids their connection to nature, which for so many had been lost. I am grateful to Alison and Kelly for taking on the challenge of heading-up next year’s important event, which for many marks the traditional start of the summer season here.” Anyone wishing to receive an advance “patronage” invitation should call 508-990-0505 x10, as soon as possible, as the event traditionally sells-out. 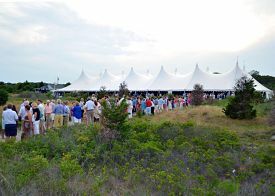 All proceeds of Clambake XXVIII will go to support the Lloyd Center’s environmental research, education and community outreach programs, and allow it to continue its practice of making its 82 acres of pristine salt marsh and ocean-side nature preserve open to the public for hiking and exploration, free of charge, every day of the year, from dawn to dusk.